Madrid (18 Jan. 2012) - On Jan. 16, new Prime Minister Mariano Rajoy said that Spain supports the introduction of a Financial Transaction Tax. Speaking at a joint press conference with French President Nicolas Sarkozy in Madrid, Rajoy confirmed that France could count on Spain's "political support", saying “I’m in favour of the tax on financial transactions.” He called for a quick decision on the implementation of the tax, and stressed that it was necessary to study "some details" of the initiative to ensure the tax would not affect consumers. Sarkozy has pledged to bring the tax in unilaterally in France if the 27 European Union (EU) member states or 17 eurozone member states cannot agree on its implementation. Last week, Italian Prime Minister Mario Monti said that he would support a new tax on financial transactions in the European Union, while German Chancellor Merkel said that the tax should be adopted in the eurozone if agreement at EU level were not possible. 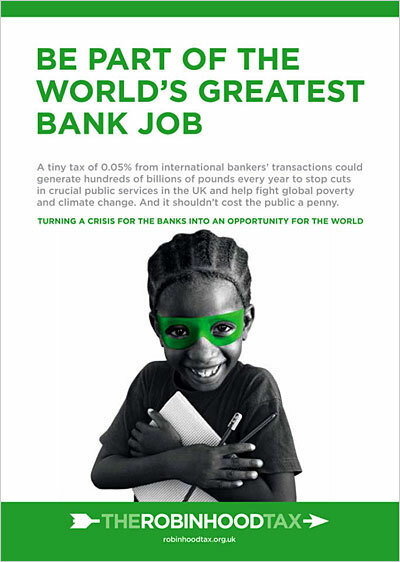 David Hillman, spokesperson for the Robin Hood Tax campaign, said, “Governments across the political spectrum understand it is a matter of fairness that the financial sector puts right the damage they have caused. “Yet the UK Government has decided to let teachers and nurses, the poor and the unemployed pay for the mistakes of our bankers instead.